Now that our laying hens are finished with their molt, it is time for them to get back to work. Chickens naturally lay the most eggs at the time of year when the days are longest. You can fool them into laying more by putting lights on in their houses to extend the day length. The advice we have heard is to add lights in the pre-dawn hours only. (The chickens are less stressed if allowed to settle down for the night at the pace of a natural sunset.) 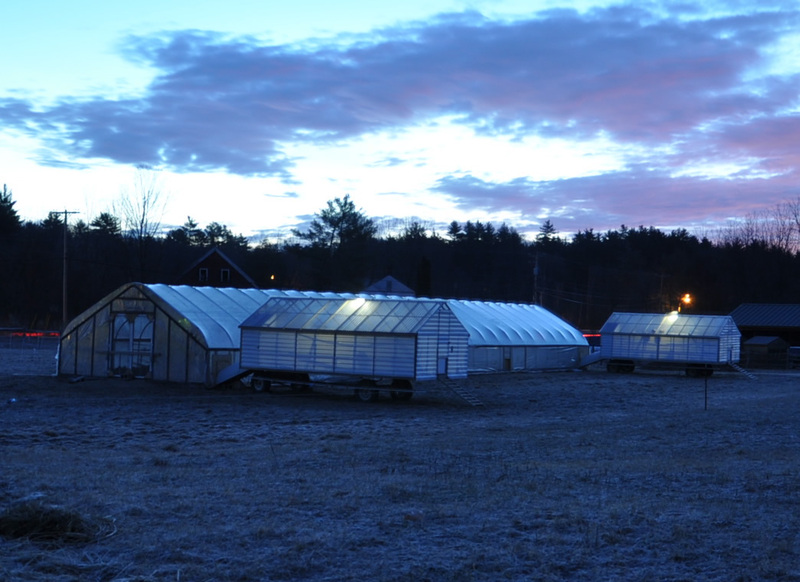 The photo above shows our mobile chicken houses (now docked to the greenhouse for the winter) with the lights on at about 6:20 this morning. I have posted before about our nifty electronic controllers that turn the lights on a little bit earlier each morning. In addition to running the lights, the controllers also open the eggmobile doors at sunrise and close them at sunset to protect the hens from predators. The whole system—controllers, lights, and door motors—runs on 12 volts DC. During the winter, we use transformers to plug them into 110 volts. But when the pastures green up, these egg ships will launch again, running off deep cycle 12V marine batteries.